After almost missing my connecting flight, surviving over eleven hours of travel, and freaking out I would not be able to enter the country since I didn’t have my return flight purchased, I made it through the Barcelona airport. Because we had talked via Skype a couple times, I recognized the family as soon as I walked out from baggage claim. I met Jordi, Roser, and their daughter Mar (Adrià was sick with chicken pox and was with his grandparents, poor kid). They insisted that I grab a sandwich at the airport, so I sat there chewing slowly and feeling every bit as awkward and nervous as I thought I might. Again, it hit me in waves how real this was, and how almost completely alone I was. But a bigger part of me was nothing but excited. They were so nice, and I was here. I did it! Bring it on, Spain. We made the drive back- about an hour all on the coast, to what would be my new home. Once in Blanes, I met Roser’s parents and we picked up Adrià since he was there. I got a tour of the house, which is connected to another house where Jordi’s parents live. It sits on top of a hill, which makes for the most perfect views. 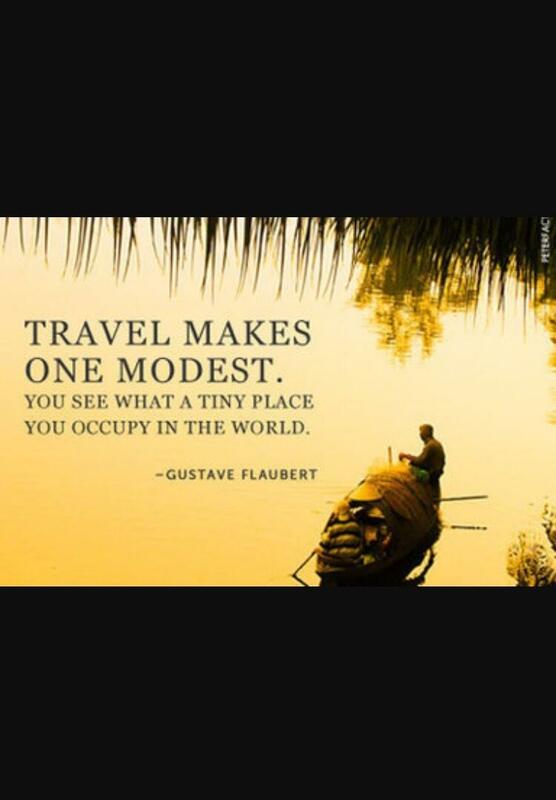 It is beautiful and modern, but a modest size. The children share a room and have a bunk bed, and their play room was converted into a space for me, with a bed, a giant bean bag, a desk, and a small dresser. 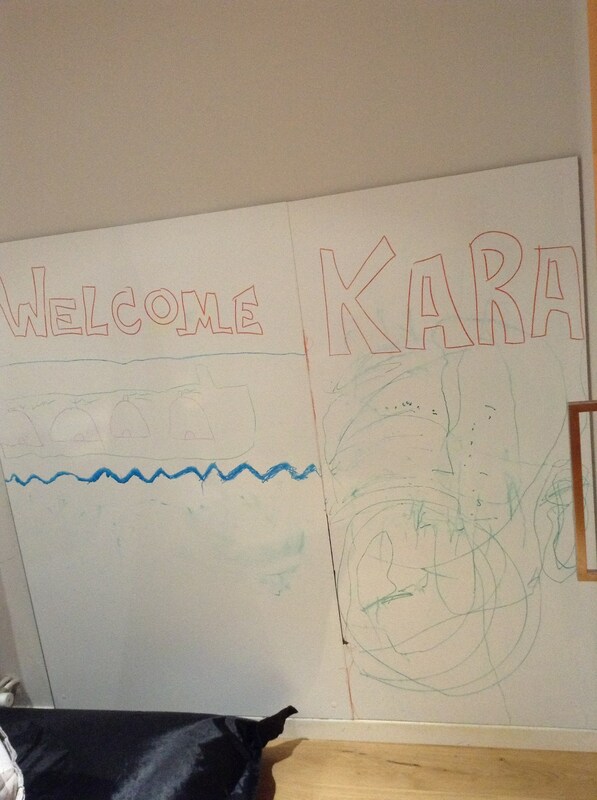 In the corner, a giant white board read “WELCOME KARA” and beside it, bright colored drawings and paintings from the children. I took a short nap to recover from the jet lag, and then joined the family at the pool, which is on the deck above us- at the kids’ grandparents. It was so cold but I dived right in! Mar is such a good swimmer, it is incredible. She is the most beautiful little girl with perfect dark curls and crystal green eyes, very smart too. I was told she would be shy compared to Adrià, which is true. He came right up, yelled to me and kissed me and hugged me hard. Everyone kisses each other on the cheek, it’s great. Maybe because it makes me feel sophisticated, or just because I’m super affectionate. With Mar, who is almost five, I think she knows that I don’t understand her language but Adrià (who is three) just repeats himself after he asks a question if I do not answer, or answer incorrectly. I had no idea how truly difficult the language barrier would be. I took three years of Spanish classes several years ago, and they don’t speak Spanish anyway, but Catalan. It is so different. I can recognize or guess some words and their meaning when reading Spanish but I am terrible speaking it. 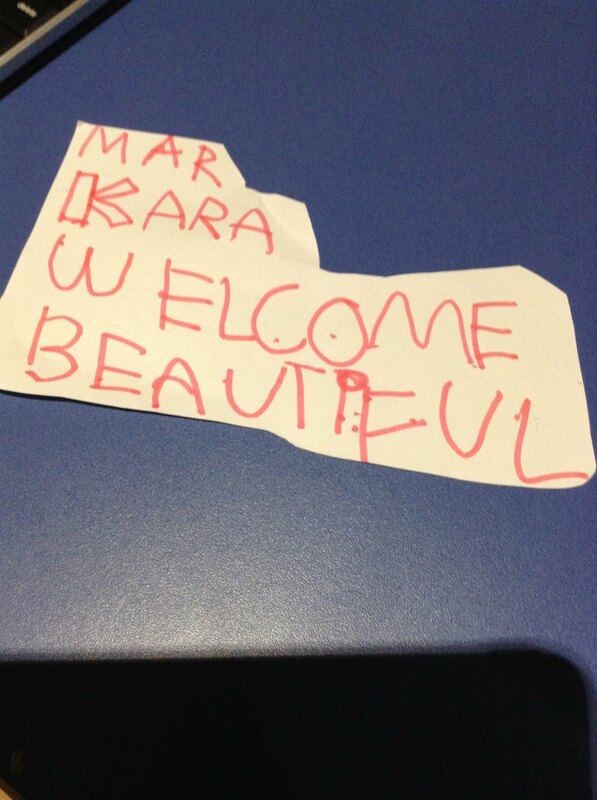 Mar knows how to count from one to ten in English now and is learning her colors. There are four fish (diving toys) that I will throw into the pool and she swims to the bottom to get them, so I taught her blue, yellow, pink, and green. Roser’s English has improved from when we first Skyped although it is still hard with Jordi not here to translate for us. We’ve used her phone or my iPad a couple times but it is not always the most effective tool. It usually ends up in laughter or frustrated apologies. Jordi is a chef and works six days a week, and incredibly long hours. They really do have the most beautiful family, and are so nice to me. I am grateful. However, I feel helpless and like I’m taking up space and am just another mouth to feed. I made a silent vow to start putting more effort into learning their language. Adrià and I- he’s a firecracker! 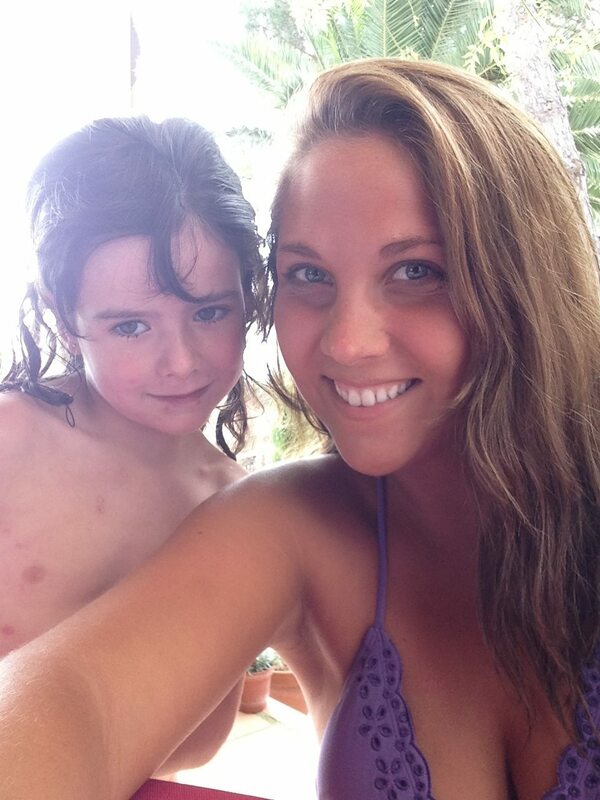 Mar and I after swimming. After the nap (which was in a mixture of Spanish, Catalan, and English- what a headache!) Roser, the kids, and I went to the center of town. Lots of shops, older cafes, narrow streets in cobblestone- it reminded me of Italy. I met a couple friends of Roser’s- all mothers, whose kids were in school with Mar and Adrià. I don’t have kids to relate to them, nor could I even understand what was being said. So I just watched the kids play and tried to look useful, offering a smile every now and then. Adrià and Mar rode their bikes around the playground -and they make me so nervous with some of the things they do. Since I can’t keep them in a bubble, or protect them from everything, my first instinct is to run after them and help them if they fall. But most times they surprise me. They just get back up and keep running in circles and screaming. Now may be a good time to admit that I don’t have any experience with kids, and don’t want my own. Probably something I should have strongly considered before I signed up to be an au pair, huh? We came back home and had dinner (hamburgers, pasta, yogurt for dessert), and played games. Mar draws me a lot of pictures. Everything we eat for dinner, she covers in olive oil. My type of girl right there. I’m falling asleep as I wrote this but I finally thought I figured out how to work the adapter or connector thing and blew a fuse. No, honestly- the thing set off a vicious spark, had this horrible burning smell, and I freaked out. Then I noticed the wireless got disconnected. Roser didn’t say anything to me so I don’t know if she knew it was me but she fixed it sometime because when I woke up it was fine. But now I’m at 15% battery and terrified to charge it…I don’t wanna fry my iPad because it is literally the only thing I have to communicate with my family, friends, and my connection to the rest of the world on that side of the sun. Talk about first world problems. What part of me thought I could do this, again?! What fun trip you had…jajaja..please don’t fry your iPad lest you cant communicate with your family anymore!! I thought it was funny too! But the iPad is okay. Thanks! Glad. I know i would freak out too. Cheers. Lol.. Adrià sounds interesting kid.. And as you said, understanding kids are one hell difficult task 🙂 🙂 Enjoy! Hope you’ll start understanding Catalan soon with Adrià 🙂 🙂 Cheers! In this kind of situation staying in present moment gives 100% excitement. Your body and mind should be together. 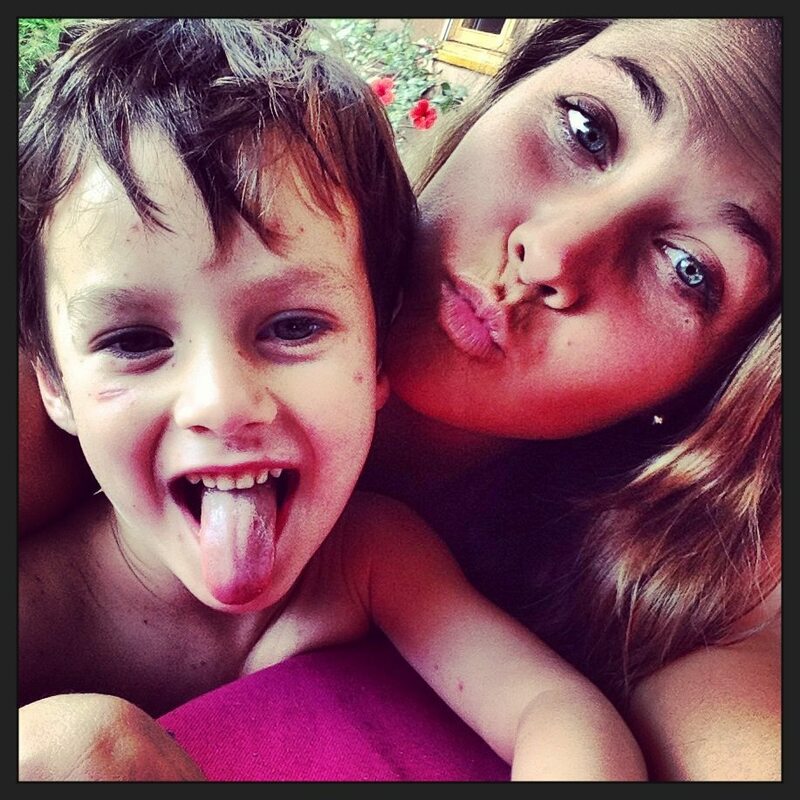 Hello there, glad you´re having a nice vacation in Cataluña. I´m from Spain, Madrid. And as you can imagine we really don´t get along with great part of the people living in Cataluña since a great percentage of them don´t want to be part of Spain, but there is also a great part of those citizens that do consider themselves Spanish. I could go on about the politics and such, but I do remember going there when I was 17 and the guy in the store not responding to me when I asked him in Spanish how much for the shoes. I do remember him saying he didn´t speak Spanish. I also remember that after I did curse him out in Spanish telling him that he was Spanish and in Spain you do speak Spanish he actually responded back in Spanish with not such kind words really. Quite good Spanish insults for a guy that didn´t speak Spanish because he was Catalan. Not much love lost between a lot of Spanish with Catalans, but they do have great wine and food. By the way, great poem the one titled “Mathematics” original and smartly written.